1. In a saucepan with a tight-fitting lid, bring 2 cups water to a boil. Add the green tea, cover tightly, and let steep for about ten minutes or until your desired strength. Strain. 2. In another small saucepan, combine the water and the gelatin. Let sit for about five minutes as the gelatin softens and blooms. 3. Add the sugar to the gelatin and cook over medium-low heat until the sugar completely dissolves but do not let the water boil. Remove from heat and whisk into the tea. Add the lime zest, if using, and let cool at room temperature briefly. 4. 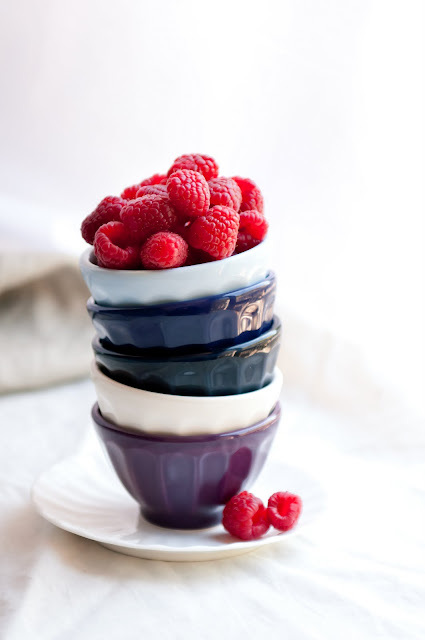 Divide the raspberries amongst the ramekins and pour the tea over the raspberries, pushing the raspberries down gently if they float. 5. Chill until the jelly has solidified, about four hours. Tip: In case you can't get Lupicia's paradise green tea, its ingredients are green tea, rose petal, marigolds, safflower, and cornflower. 1. Preheat the oven to 325 degrees F. Prepare six 3-oz. ramekins in a hot water bath, filling the water 2/3 of the way up the sides of the ramekins. 2. Place the chopped chocolate in a heatproof bowl and set aside. 3. In a small saucepan, heat the heavy cream, milk, sugar, and espresso powder until the mixture comes to a simmer. Remove from heat and pour over the prepared chocolate. 4. Let the chocolate sit for about a minute and then whisk until smooth. 5. Temper the egg yolks by pouring the heated chocolate mixture gradually into the yolks, whisking the entire time. 6. 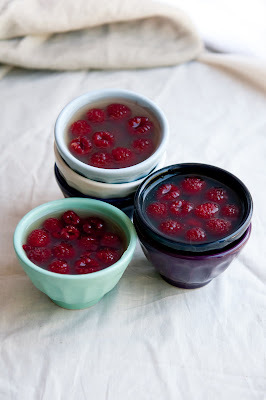 Place about 5-6 raspberries into each ramekin and pour the prepared egg yolk and chocolate mixture over them. Gently push the raspberries under the surface if they float. Cover the ramekins with aluminum foil. 7. Bake in the water bath for 35-45 minutes, until the edges are set but the custard still jiggles a little in the center when gently bumped. 8. Remove from oven and let the ramekins stand in the water bath for about 10 more minutes. Then, remove the ramekins from the water bath and cool. 1. Puree the raspberries in a food processor. Strain half of the puree through a fine mesh sieve to remove the seeds. Add the strained puree back into the reserved half and stir in enough lemon juice until you can just taste the tartness. 2. 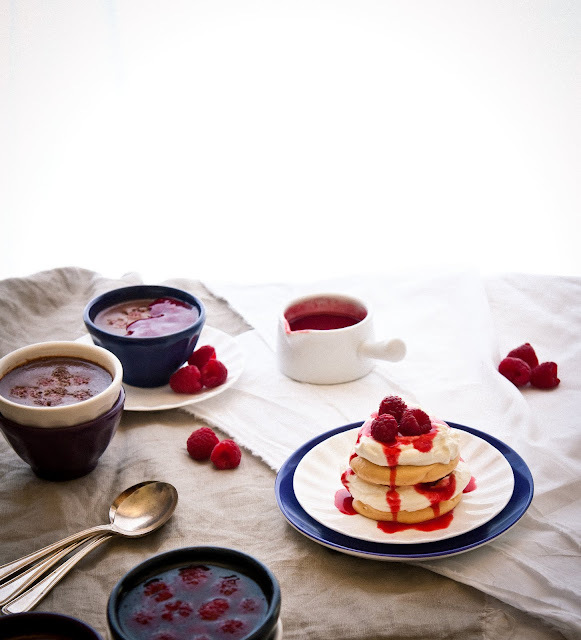 Top each pots de creme with raspberry coulis. 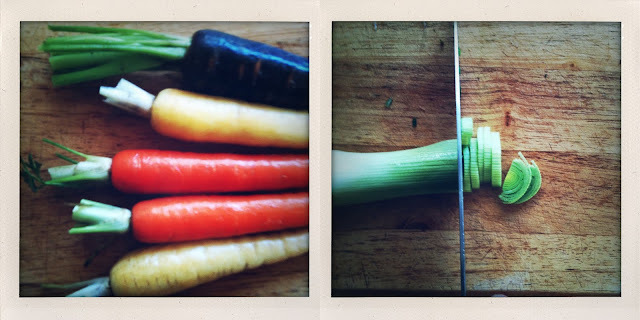 Tip: I like straining only half of the puree because I find that it gives the coulis a nice seed-to-puree ratio. If you don't like the seeds, go ahead and strain all of the puree. Tip: Frozen raspberries work really well for the coulis because they release more liquid. 1. Preheat the oven to 280 degrees F. Prepare a baking sheet lined with parchment paper or a silpat . 2. Whisk the egg whites on low until the surface is entirely covered in foam. Then, increase speed and continue whipping on medium high, gradually adding the superfine sugar. Whisk until you reach glossy stiff peaks. 3. Whisk in the corn starch, vinegar, rosewater, lemon zest, and food coloring, if using, being careful not to overmix. 4. Spoon or pipe the meringue onto the prepared baking sheet in 12 flat disks. Make an indent with the back of a spoon on top of each meringue. 5. Place the meringues into the preheated oven. Immediately lower the oven temperature to 230 degrees F and bake for an hour and a half to two hours, until the outside of the meringues are dry to the touch. Turn off the oven and allow the meringues to cool completely inside. 6. If making ahead of time, store the meringues in an airtight container away from humidity. 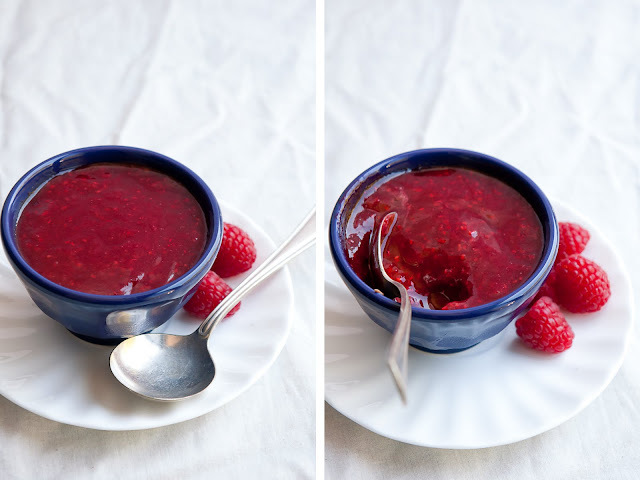 Raspberry caramel recipe adapted from Chez Panisse Desserts by Lindsey Shere . 1. Puree the raspberries and strain. You should end up with about 1/4 cup of raspberry puree. 2. In a light-colored, heavy bottom saucepan, combine the sugar and 1 Tbspn of water, and stir until the sugar is completely moistened. Cook on medium high without stirring (swirl the pan to insure even cooking instead) until the sugar is a light golden caramel color. 4. Return the saucepan to heat and cook, stirring, until the caramel has completely dissolved. 5. 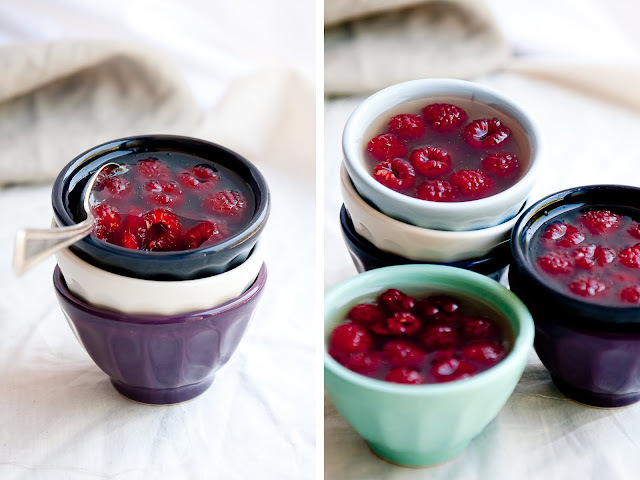 Remove from heat and stir in the raspberry puree, lemon juice, and kirsch or brandy, if using, to taste. 1. By hand (preferably) or with a mixer, whip the cream and mascarpone cheese until soft peaks. Do not overmix. 2. Stir in the powdered sugar and lemon zest to taste. 3. 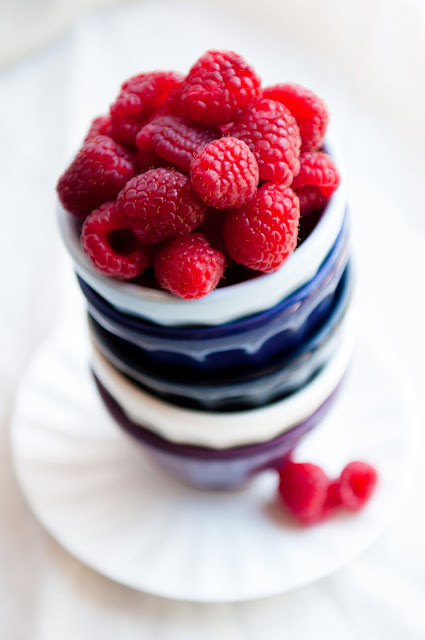 In a small bowl, combine the raspberries with enough rosewater to coat them. 4. 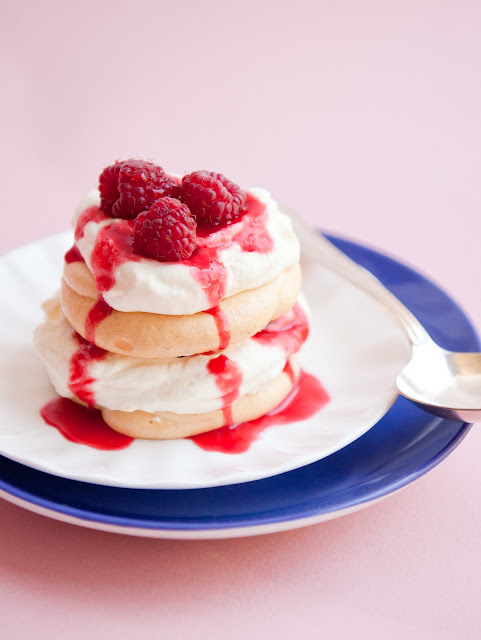 Layer the meringues, cream, and rosy raspberries, drizzling with raspberry caramel. 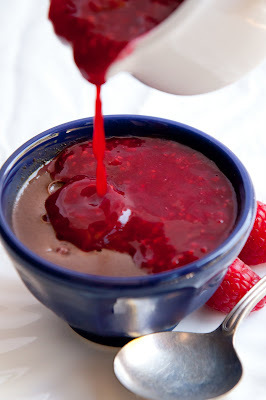 The chocolate pot with raspberry coulis is just Gorgeous. Ofcourse the others are amazing but when mentioning chocolate and raspberries together you caught my attention 100%. YummY! incredible rhapsody of delicious desserts! i love it! this is an amazing post - now i have so many ideas floating in my head, wishing i did not eat that punnet of raspberries for breakfast LOL! will need to get a few more! 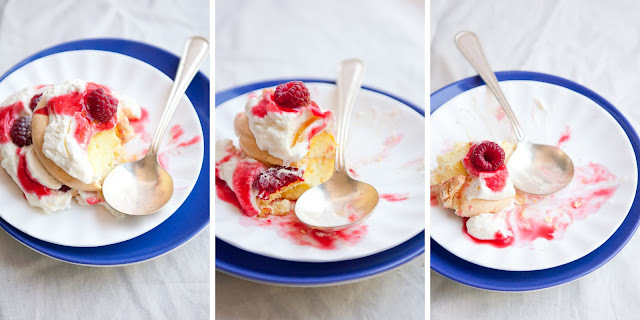 What a fun post and what an incredible line-up of raspberry dessert! What a lucky friends you have. Your photos are really lovely. Oh my! This looks amazing. Great photos as well. 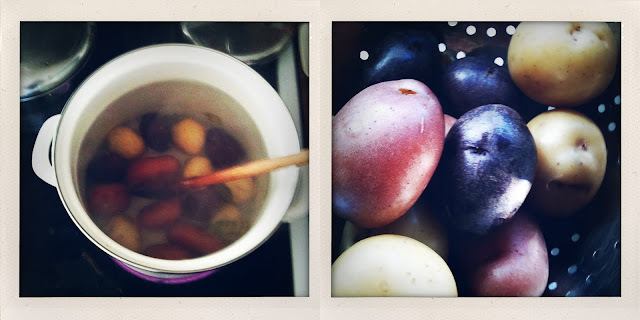 Gorgeous post - colors are lovely, and you've really captured that summer to fall essence! I would say you finished with a big raspberry bang for sure! These look great. The Lemon and rose-scented pavlova etc looks especially yummy to me. And I like that the desserts represented different things. lol Awesome! 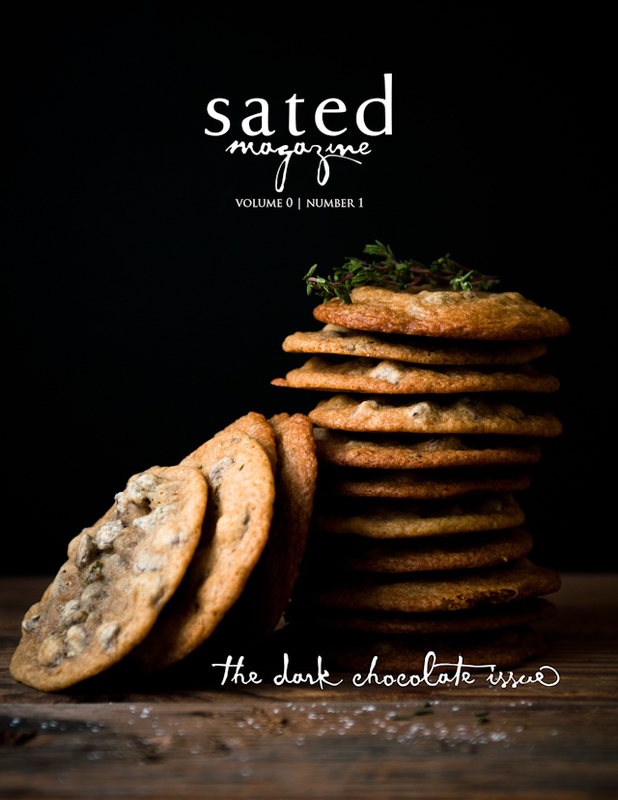 The close-up of the stack is just mouthwatering and great title for such a delectable creation :). I can't get enough of red berries either. 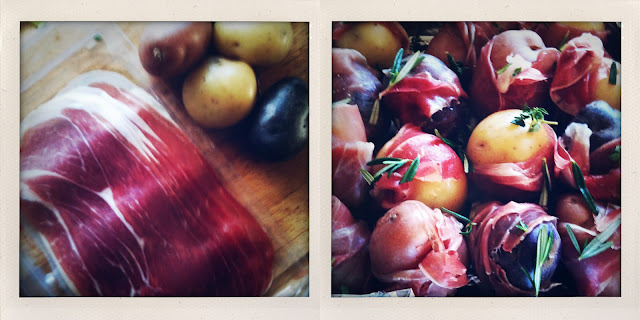 A feast to my eyes and makes my mouth water! - Your friends are very lucky to get such a menu. - I love OED geekery. @Poires au Chocolat: ha! 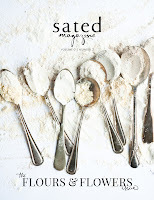 I'm happy that there's at least one other OED-appreciating foodie out there!